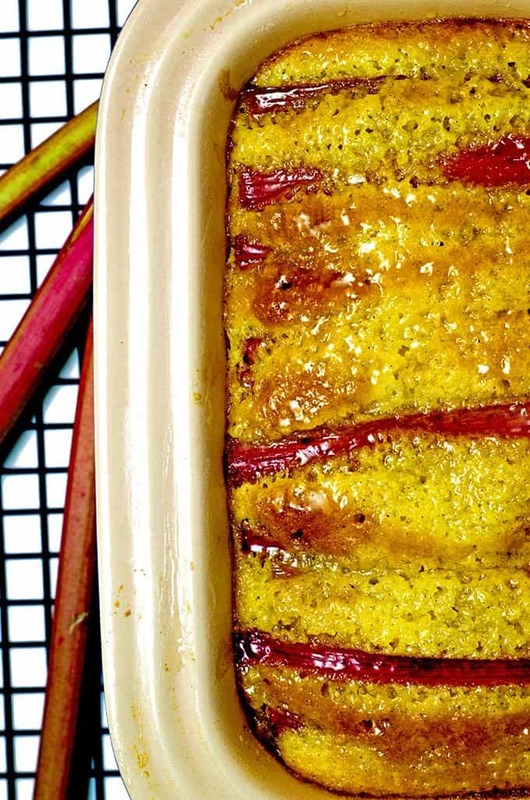 Today we showcase this Rhubarb Vanilla Pound Cake from Melissa Clark via the New York Times. It’s clearly another rhubarb sensation and in case you don’t care for rhubarb, we’ve got you covered. You can make this gorgeous vanilla pound cake with blueberries, strawberries, peaches, or, nothing at all. It’s that good! When I was a kid I wouldn’t go near anything that my mom would make with rhubarb. Now I’m growing old and I can’t imagine myself staying away from the stuff that signals the beginning of summer and all of it’s glorious foods. I’ve had my eye on this vanilla pound cake recipe for a few weeks now and when I first saw it in the New York Times Cooking section I knew I had to make it. This rhubarb cake has tender stalks of vanilla-poached rhubarb in it. Most of us think that the red stalks of rhubarb are sweeter and taste better than their green counterparts. Although red rhubarb may be prettier to look at, green varieties of rhubarb such at Victoria are among the sweetest. Here’s a good resource on rhubarb varieties. 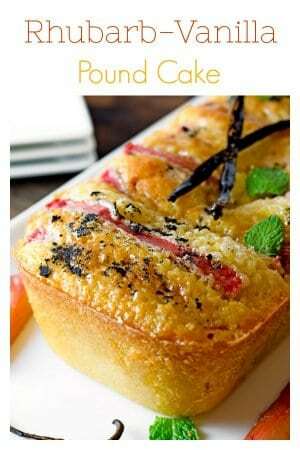 Red stalks of rhubarb add a nice color to this vanilla pound cake. You can can find vanilla beans at most spice stores, like Penzy’s. 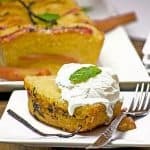 The base flavor of this vanilla pound cake recipe comes from a vanilla bean and it’s seeds, along with some pure vanilla extract. 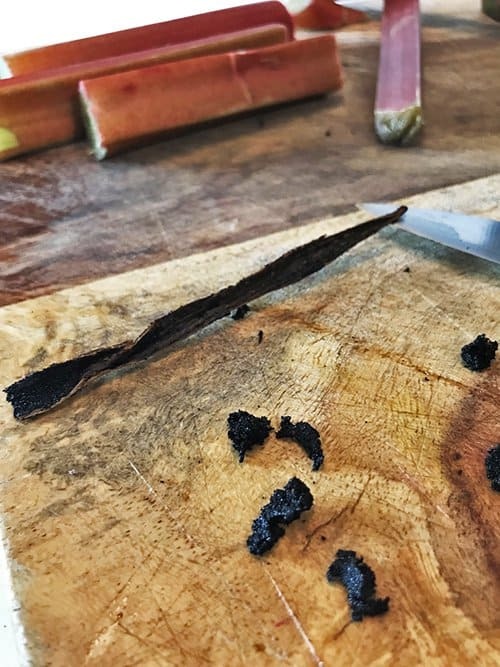 I’ve never worked with whole vanilla beans in the kitchen but thankfully I found a couple of them that I had picked up at Penzy’s Spices, some time ago. Fortunately, if you keep vanilla beans sealed and protected from light, they will last for a couple of years. A simple syrup is created using the vanilla beans and their seeds. The rhubarb segments are poached in the vanilla simple syrup. 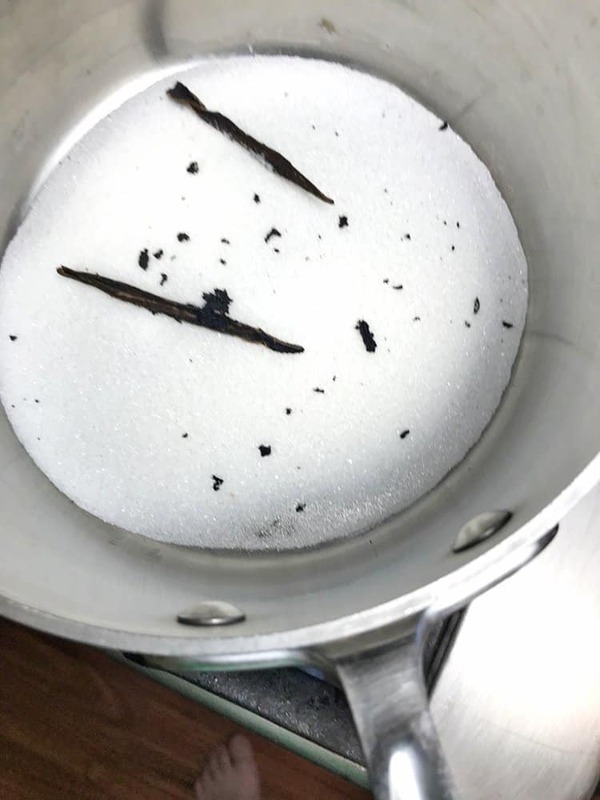 Combine some sugar with water, add the vanilla bean and it’s seeds and bring to a boil. Reduce this mixture to a simmer and add the cut and sliced rhubarb segments and poach for about 2 minutes. 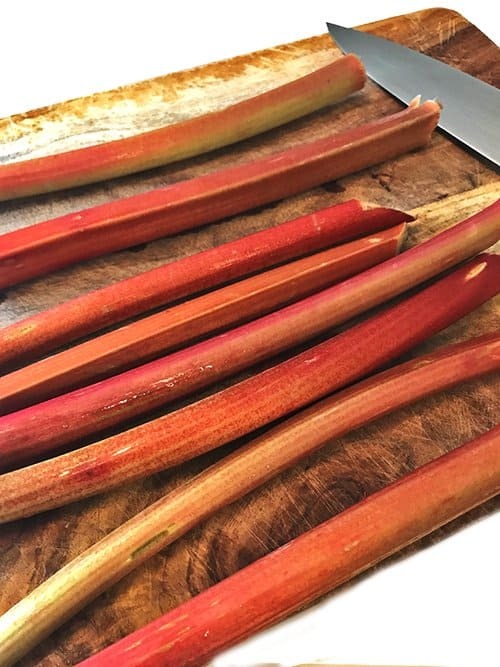 Remove the rhubarb and let it cool to room temperature and reserve the poaching liquid – you’re going to use this once the rhubarb cake comes out of the oven. Start the cake batter by creaming some butter with the eggs. Add the cake flour to the wet ingredients, a little at a time. Grease and flour a loaf pan. Scott shows you how to grease a pan in this great little post and video. Cream the butter with the eggs. When making a cake from scratch, always bake with eggs at room temperature. This will help the eggs to spread in the batter more evenly and help to created a lighter and smoother texture. Also, add the eggs one at a time. This way, if you have a bad egg or get some loose eggshell in with the egg, you won’t have to toss out the whole recipe. Add the cake flour a little at a time. 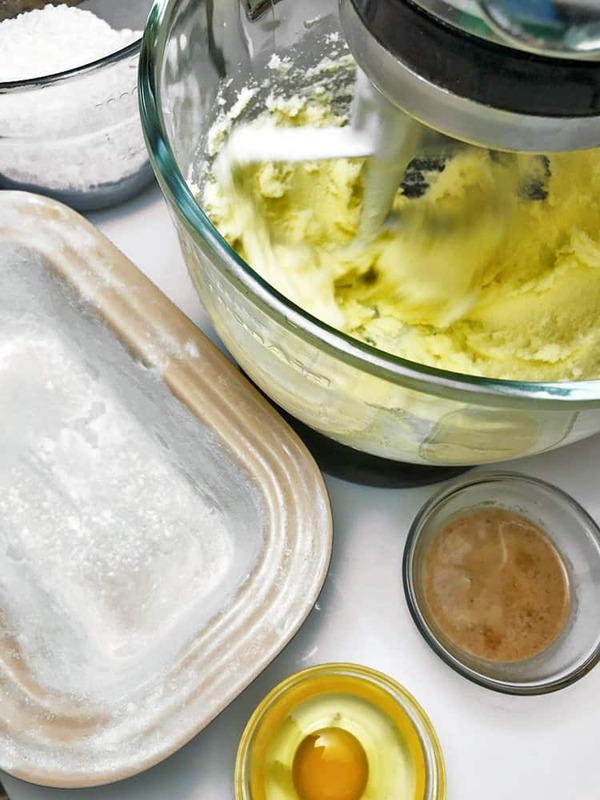 Again, this will help you get an even texture in the cake batter. In case you don’t have any cake flour on hand, here’s a handy article on how to make your own cake flour. Finally, add the milk and vanilla mixture to the cake batter, until just blended. When using a KitchenAid stand mixer to make a dough or batter, always use the lowest gear possible. If you don’t, there is a “worm gear” in the KitchenAid that will break and cause it to not work. This is actually a protective mechanism that will keep the motor from burning from being overworked. If this happens, the good news with this scenario is that you won’t have to replace your KitchenAid. The bad news is you will still have to have it repaired to replace the worm gear. 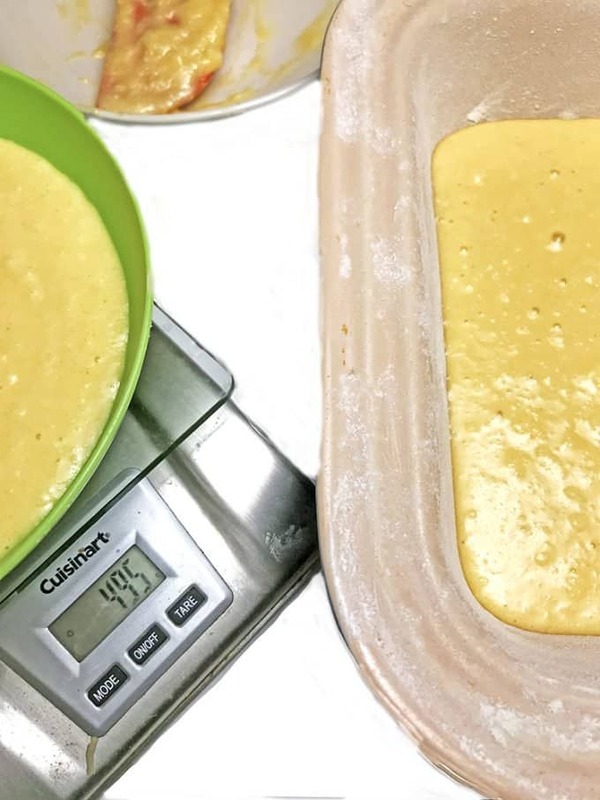 Now you want to divide the cake batter in two even portions and pour half of it in the prepared loaf pan. I’m a bit of a nerd and I enjoy playing with kitchen gadgets but I also like accuracy when baking, it can make or break a cake recipe. For this reason, I always try to measure cake batter by weighing it if it has to be divided with precision. It’s always best to weigh batter if you have to divide it evenly. Call me a nerd, or maybe a baking nerd, but I love my kitchen scale. We bake a lot with our kids too, it’s something they love to do. Using a kitchen scale to ensure accuracy helps their recipes to turn out better and it’s an awesome review in mathematics for all of us! 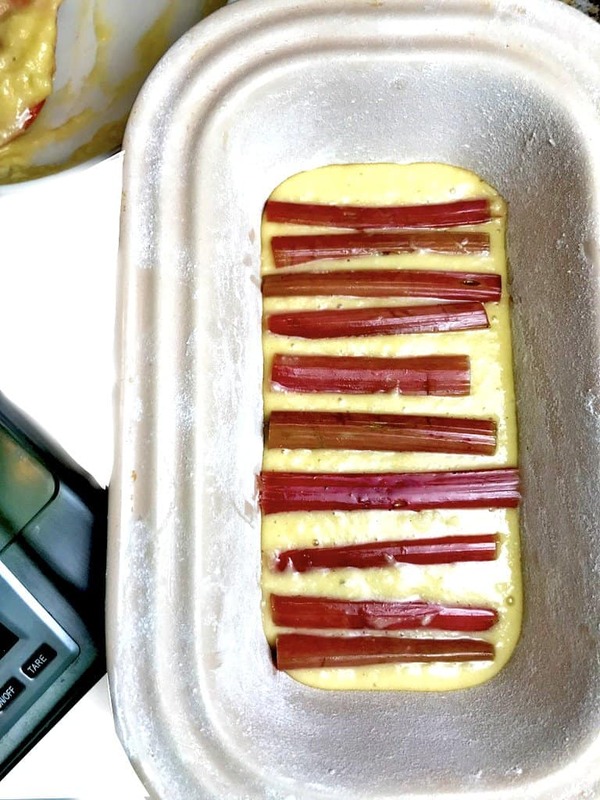 Pour half the batter in the loaf pan, top with a row of rhubarb. Pour remaining batter over rhubarb. As you can see, half the rhubarb is added to the first layer of batter. Then, the rest of the batter is poured over the rhubarb. We’re going to bake the the cake for about 20 minutes at 350° F, just long enough for the top of the batter to “set”. Then we will add the top layer of rhubarb and finish baking this delicious rhubarb cake. Put the Vanilla in this Vanilla Pound Cake! When the cake comes out of the oven brush it with vanilla simple syrup. Once this rhubarb cake comes out of the oven, you’re going to brush it with the reserved poaching liquid from earlier. First you’ll reduce it slightly and you’ll probably have a bit leftover. Hint: Before adding this layer of vanilla simple syrup, use a tooth pick and poke a bunch of holes in the top of the cake, evenly throughout. These little pores will allow that sweet vanilla goodness to seep deep within the cake, adding flavor while preventing your cake from drying out. You can see, we garnish the top of this vanilla pound cake with some additional vanilla beans, and a leaf or two of fresh mint leaves. The colors, textures, and most of all flavors all work magic together. 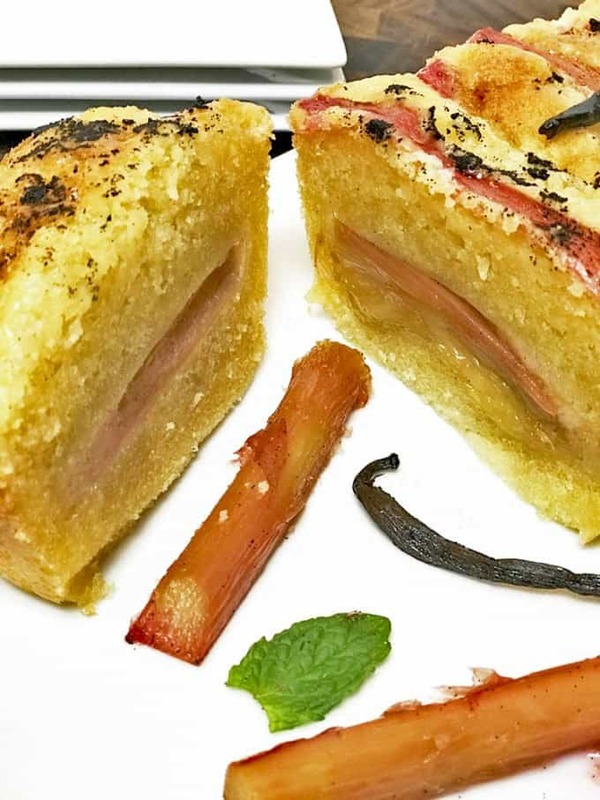 Our guests raved over this rhubarb cake. Don’t care for rhubarb? 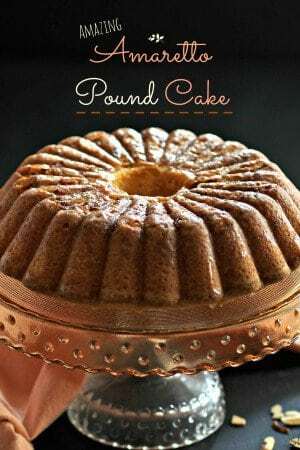 Try substituting blueberries or strawberries or peaches in this vanilla pound cake. Rhubarb makes its appearance here in the mid-west as a signal of beautiful weather and fresh produce. We have a few other great rhubarb recipes that you might like, including our rhubarb slush, and our rhubarb upside-down cake. See all of our nearly 30 cake recipes here. 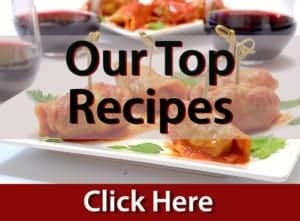 Here are a few other Melissa Clark recipes that we have covered. Try this Rhubarb Vanilla Pound Cake and let us know what you think of it! 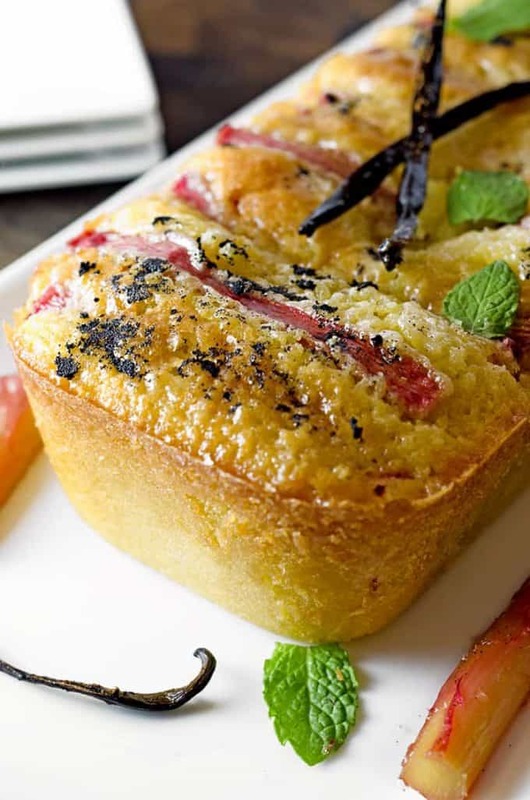 Inspired by Melissa Clark, this vanilla pound cake recipe is fortified by sweetened and vanilla-poached stalks of tender rhubarb. Try this rhubarb cake recipe from scratch today! 1/2 vanilla bean split and seeded with seeds reserved. 1/2 vanilla bean split and seeded, with seeds reserved. Use a chef's knife to cut the rhubarb so the segments fit crosswise into a 9 x 5 inch loaf pan, about 4.5 inches. Cut about a dozen segments. Then, splice them in half again, lengthwise. Combine sugar and vanilla bean and seeds in medium size sauce pan, stir in water and bring to a boil. 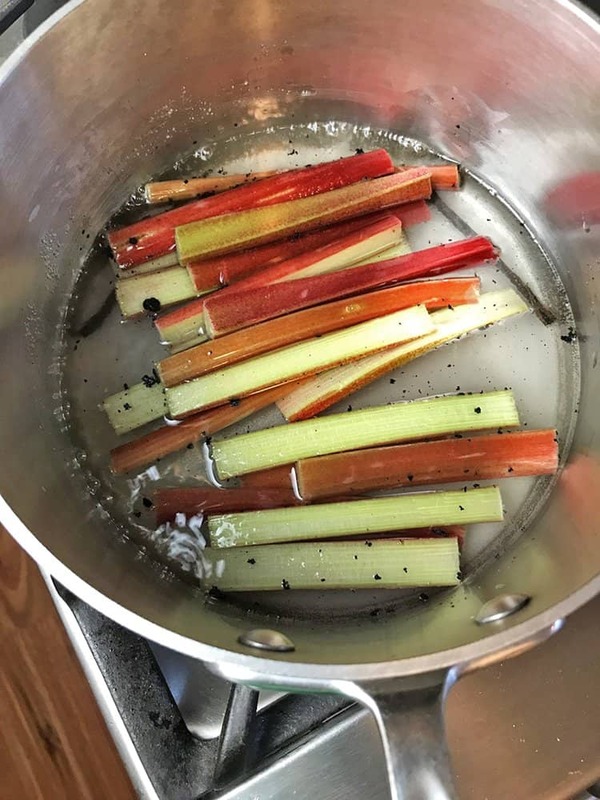 Reduce heat to simmer and add cut rhubarb segments. Allow the rhubarb to poach for about a minute and a half to two minutes. Remove the rhubarb from the liquid and cool to room temperature. Reserve poaching liquid. 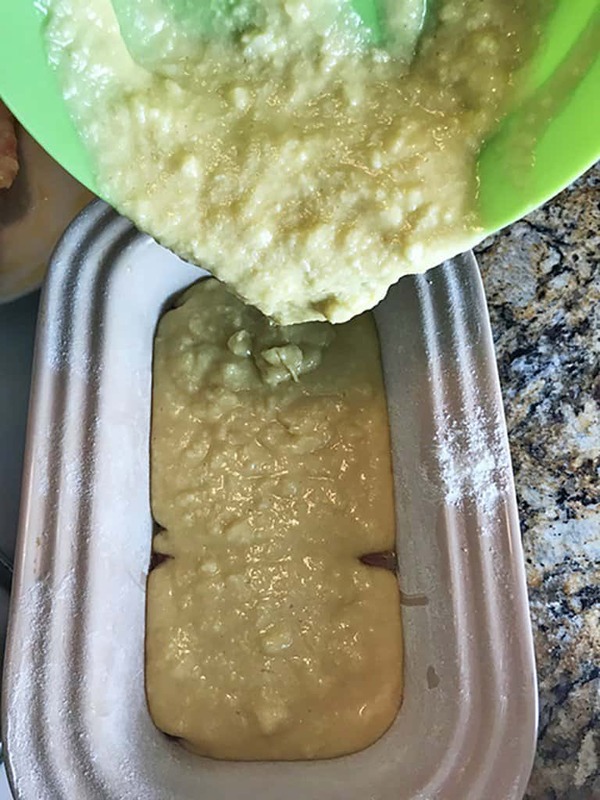 Preheat oven to 350° F and grease and flour a 9x5 inch loaf pan. Using a medium bowl, combine flour, salt, and baking powder. Use a small bowl to combine milk, vanilla extract and vanilla seeds. 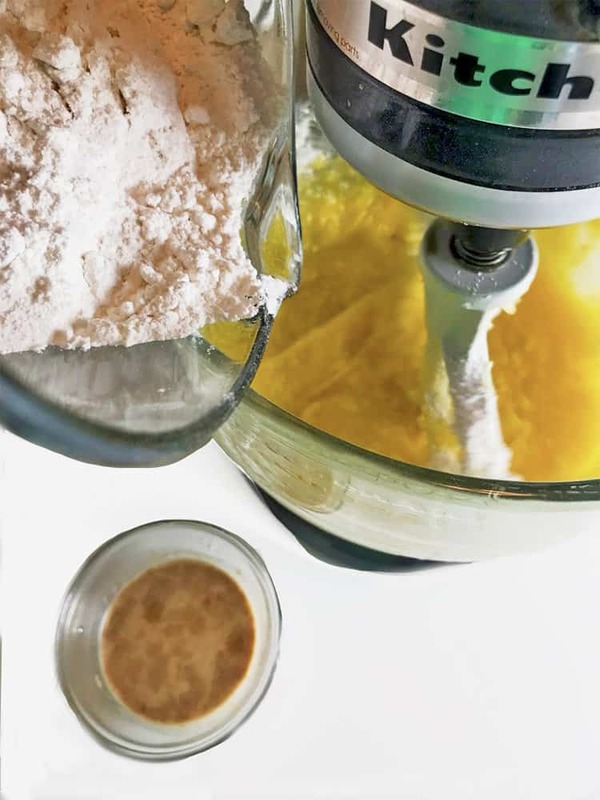 Using a stand mixer with the paddle attachment, combine the butter and sugar and cream together. Scrape sides of bowl and cream again. Add eggs, one at a time and scrape the bowl after the addition of each egg. Add half the flour mixture while beating, scrape the side of the bowl and gradually add remaining flour mixture. Finally, add milk mixture and stir in until just combined. Pour half the batter into the prepared loaf pan and lay about 10 segments of softened rhubarb, cross-ways, on top of the batter. Evenly pour remaining batter over rhubarb layer. Bake for 20 minutes to allow the top of the batter to set somewhat, then remove from oven and quickly place remaining rhubarb along the top of the batter. Return cake to oven and bake for 45 more minutes, until a toothpick comes clean from the center. While the cake is baking, simmer reserved poaching liquid over medium heat, for about 10 minutes or so, until it is reduced and forms a simple syrup. Once the cake comes out of the oven, place it on a cooling rack. Use a toothpick to poke several deep holes throughout the cake and then generously brush the vanilla simple syrup onto the cake. Allow cake to cool for at least 90 minutes before removing from pan. Garnish with additional vanilla beans if desired and the reserved vanilla beans. Serve with softened French vanilla ice cream. I first saw this on Pinterest and fell in love with the photo! This looks amazing Dan! I have been waiting for this recipe to come out since you teased us on Instagram! 😀 I’ve printed it off and hope to make it this week! Debra, it’s fantastic, can’t wait for you to try it! I can never get my hands on too many rhubarb recipes!! I have loved it since I was a kid and baking with it is one of my favorites!! Thanks for sharing this great recipe! Thanks for the comments, Michaela; I hope you give this a try! 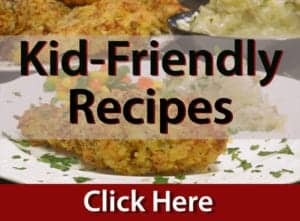 I have yet to cook with rhubarb and I didn’t know there were so many kinds! This cake sounds amazing! Can’t wait to try it! Thanks, Ashlyn! I hope you try it soon. This is fantastic! I absolutely love pound cake but have never had one with rhubarb! It sounds just perfect. Will have to keep an eye out- I think ill be able to find it at some local farmers markets. Let us know how you like it, Angela! I had no idea there were more than one kind of rhubarb. I have a few recipes Ive been wanting to try and now this one is jumping ahead of the list! Thanks for the tips! Hope you enjoy this, Michele! I didn’t know that there are a variety of rhubarb to choose from. 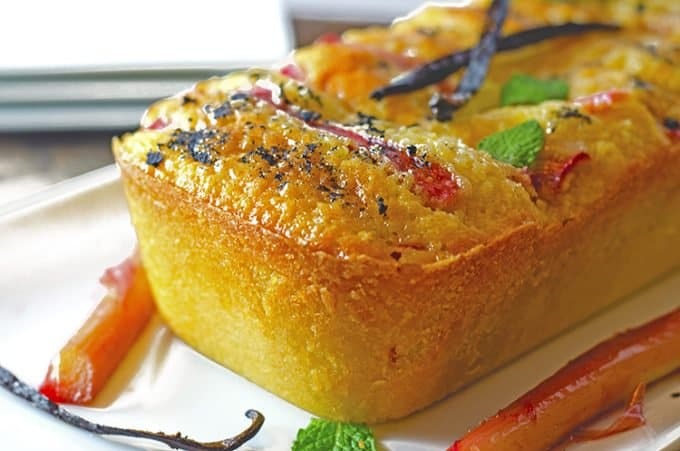 Thank you for sharing that and for this wonderful recipe! I’ve been holding onto a couple of fresh vanilla beans just for the right recipe! Found it, thanks! I hope you try this Sandra; I think you will really enjoy it! Thanks for the nice comments. Recipe doesn’t say how much water to use for the glaze. Hi Heidi. You will want to mix the sugar and vanilla with one cup of water. 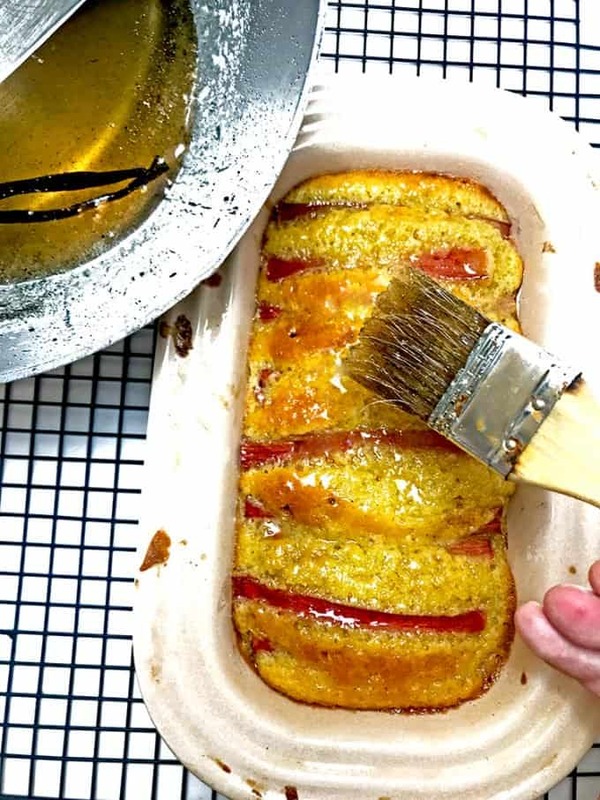 The volume is primarily used to poach the rhubarb and you’ll want to reduce it before brushing the glaze on the pound cake when it comes out of the oven.